A grieving daughter and abuse survivor must summon the courage to run a feminist conference, trust a man she meets over the Internet, and escape a catfishing stalker to find her power. Ahana, a wealthy thirty-three-year-old New Delhi woman, flees the pain of her mother's death, and her dark past, by accepting a huge project in New Orleans, where she'll coordinate an annual conference to raise awareness of violence against women. Her half-Indian, half-Irish colleague and public relations guru, Rohan Brady, who helps Ahana develop her online presence, offends her prim sensibilities with his raunchy humor. She is convinced that he's a womanizer. Meanwhile, she seeks relief from her pain in an online support group, where she makes a good friend: the mercurial Jay Dubois, who is also grieving the loss of his mother. Louisiana Catch is an emotionally immersive novel about identity, shame, and who we project ourselves to be in the world. It's a book about Ahana's unreliable instincts and her ongoing battle to deter�mine whom to place her trust in as she, Rohan, and Jay shed layers of their identities. "Louisiana Catch is a triumph. In Ahana, Sweta Vikram has created an unforgettable character, strong, wise, and deeply human, who'll inspire a new generation struggling to come to terms with their identity in a world of blurring identities." "In Louisiana Catch, Sweta Vikram brings life to the complex human rights issue of violence against women. Through one woman's journey to make sense of her past and ultimately heal, Vikram shows us that yoga can reconnect us to ourselves, and that by empowering others, we transform our own lives." 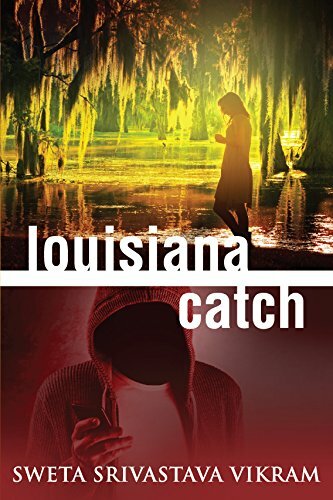 "Louisiana Catch perfectly captures what it means to be human in a digital world, where support groups meet online, love interests flirt on Twitter, and people get confused with personas. Equal parts tender and playful, moving and hopeful, Vikram's prose connects us with timeless truths about grief and redemption in a satisfyingly modern way."